Awesome hospitality, great owners! Facilities were super clean and comfortable! Beautiful and quiet. Most friendly and helpful staff and owners. Very clean and neat. Close to Grokis Beach. Our first time at Pico Bello, what a wonderful place, we had a lovely appartment with terrace, our hosts were so welcoming and kind, we are already looking forward to come back! The studio was comfy and clean, the pictures reflect the reality of the place. Mosquito net on the windows. The owners are so kind and helpfull, If there is anything you need just ask and they will provide. Free shuttle from and to the port. Bed linen and towels changed every two days. Close to Pico Bello there is the beach, few restaurants (I recommend Stamatis good food at onest prices, best moussaka ever), the bus and taxi stop and a car/scooter rental. Bear in mind that at Grikos there are no shops, the shops are all in Skala that is 4.5 km far away. The bus runs 5/6 times a day from Skala to Grikos and back, depending on the summer period. The walking path from Grikos to Skala is not a safe one and there is no sidewalk. From Skala to Hora there is the old cobblestone path safe for walking but uphill. The taxi ride costs around 7€ and the bus ticket is 1.8€. Pico bello is placed in a nice and quiet area. Thanks Georgina you are such a lovely host! Enterier and exterier of Pico Bello are so stylish with beautiful white-blue combination! Georgina and all stuffs are very kind and professional. The surrounding is calm and pleasent. Spotless clean large room. Very tranquil location. Owners very friendly and accommodating. Housekeeper excellent at her job. Very nice place to stay. Will be back. The apartment was spotless, very well equipped and comfortable. Staff were very helpful and friendly and the apartment was cleaned and bins emptied every day. 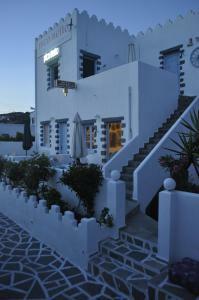 The location is perfect for a quiet holiday, next to a beach and with a choice of several tavernas. There is a bus service to the village but I was happy to walk around the island. 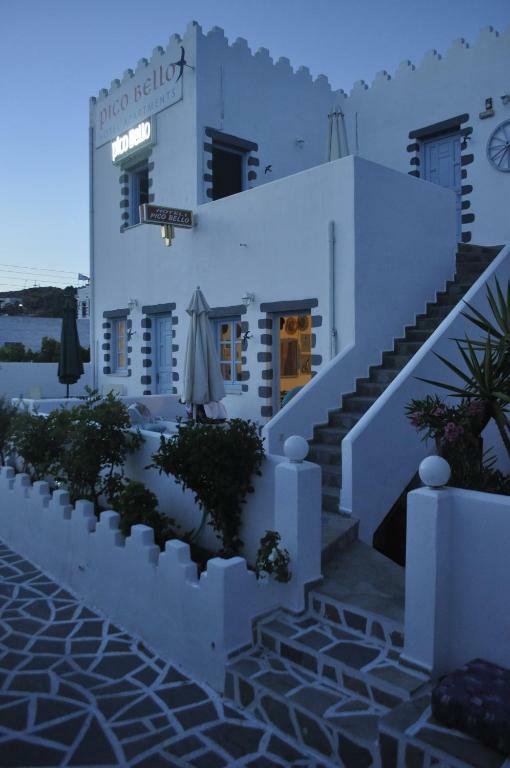 If I return to Patmos I would definitely stay here again. Room was spacious enough to accomodate 3 people and the belongings. Sitting area at was useful for breakfast an evening leisure. Due to unique architecture each room has good privacy. The house owner is the kindest, he treated me and my friend as we're his own daughters, as soon as we arrived he gave us all the advices and he helped us feeling welcomed in the island. The room is very clean and spacious, the fornitures are in a lovely greek style in different shades of blue. They clean the room every morning for you. The position was perfect for us as it is in a quite area, 10mins by car to the main places of interests and nightlife but you can still enjoy the silent of mornings and afternoons. There're two lovely tavernas just by the end of the street, right on the beach. 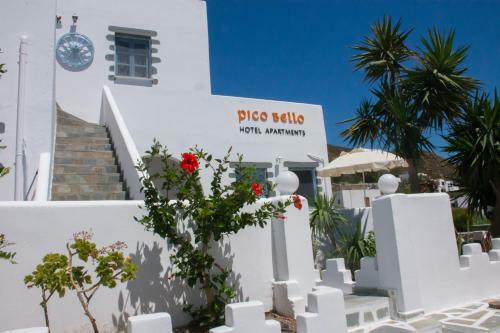 Lock in a great price for Pico Bello – rated 8.9 by recent guests! Pico Bello This rating is a reflection of how the property compares to the industry standard when it comes to price, facilities and services available. It's based on a self-evaluation by the property. Use this rating to help choose your stay! 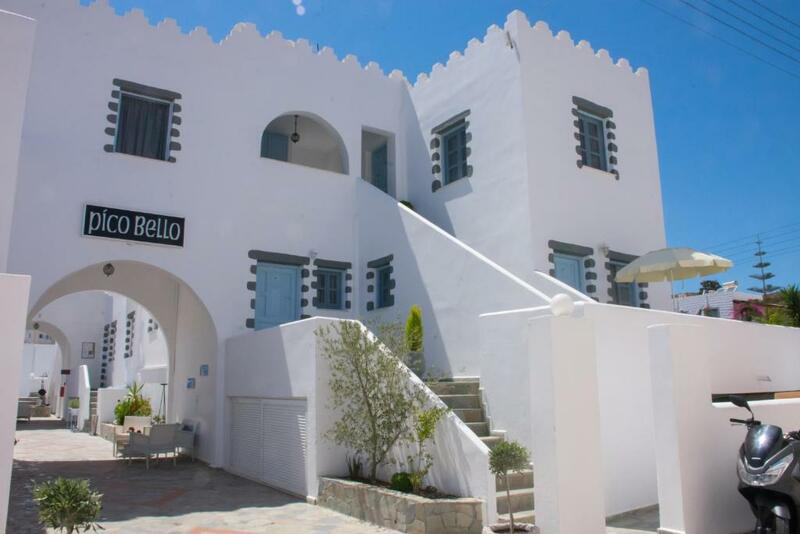 The traditionally-built Pico Bello is located in Grikos Village of Patmos, within 150 feet from the beach and a short walk from taverns and shops. 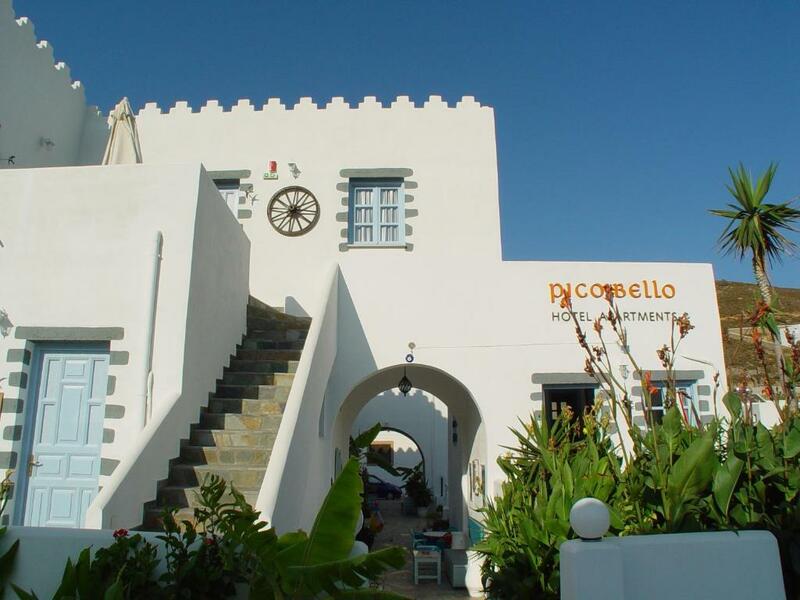 It offers spacious studios with a balcony overlooking the Aegean Sea or the garden. Decorated in white and blue tones, the studios of Pico Bello have a small seating area and a kitchenette with dining area, fridge and cooking hobs. Air conditioning, a TV and a private bathroom with shower are available. Free transfer from the port can be arranged upon request and free public parking is possible nearby. 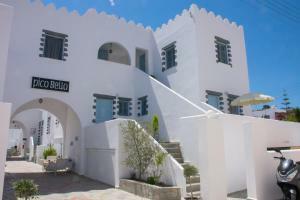 This property is also rated for the best value in Grikos! Guests are getting more for their money when compared to other properties in this city. When would you like to stay at Pico Bello? Just 164 feet from the beach, this air-conditioned studio opens to a balcony overlooking the Aegean Sea or the garden. It includes a kitchenette with dining area, fridge and cooking hobs. A TV and a private bathroom with shower are available. Pico Bello is located in Grikos area,Just a few minutes walk from the graphic beach of Grikos.Where you can find several taverns by the beach.It is a quiet place for relaxing holidays.2 minutes away by car from Chora and Skala. I love to travel and to meet people from different countries. When I can not travel I read so I get to travel with my mind. I love to take long walk by the beach site with my dog which I adore. I love the beauty of the nature. Grikos is a peacefull place with a wonderful bay,where you can find several restaurants and taveras facing the beach.It is a fantastic place for people that want to have their holidays near the nature.Only 3.5 Klm. away from Chora and Skala is an ideal place. House Rules Pico Bello takes special requests – add in the next step! One child from 2 to 10 years is charged EUR 13 per person per night in an extra bed. Pico Bello accepts these cards and reserves the right to temporarily hold an amount prior to arrival. Liked everything about the accommodation however the village could do with a small shop for essentials. Also bus times not frequent enough however would not deter us from returning. I liked everything about the apartment. A bigger soap in the bathroom and a toaster would have been fine. 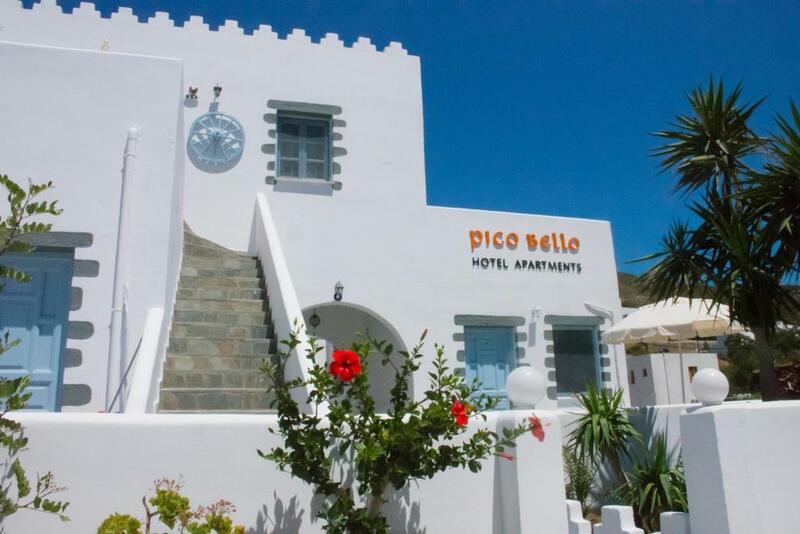 Everything was fine and we decided to extend on stay at Pico Bello and on beautiful Patmos. Pico Bello was very good! The hotel-studio rooms are split-level as on the pictures and larger than most rooms in Greece. The apt was very clean, the beds were fine, plenty of hot water each morning and evening and the wi-fi worked great every day during our 12 day stay! Bathroom was clean and everything was working. Shower has a shower curtain but it was no problem and the bathroom floor did not get wet. All rooms have a nice roomy balcony and the upstairs rooms have some views of the area and some of the bay. No traffic noise at all in the evening, a quiet location just off the not busy street. We were warmly welcomed by Manolis the owner who greets most of his guests at the port ferry, but we rented a scooter and got there ourselves, easy to find PicoBello in Grikos bay. 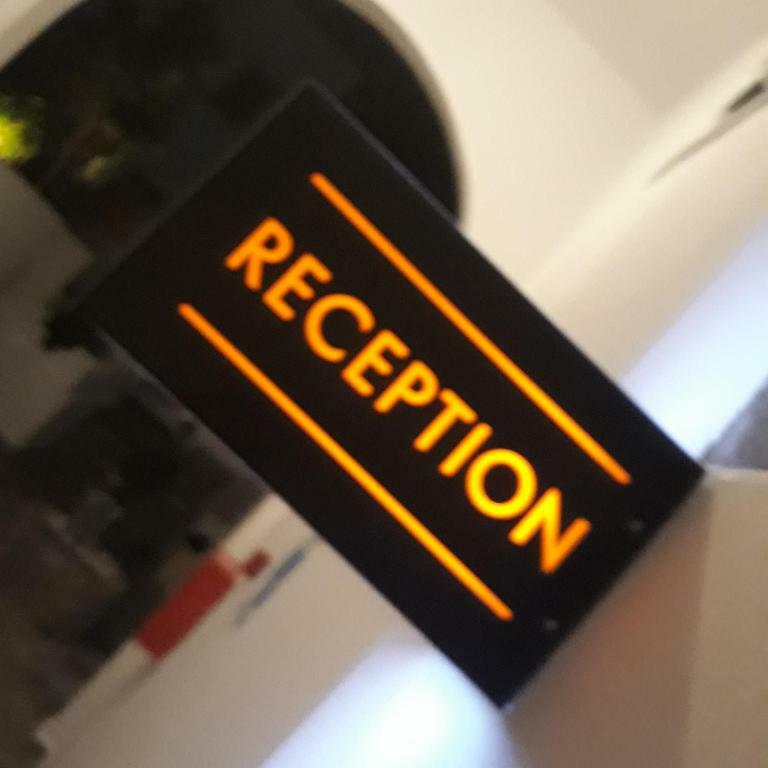 The apt has a small kitchenette and everything was working fine, even though we did not cook ourselves with all the fine tavernas on Patmos. Added surprise at PicoBello is that the rooms were fully cleaned every day during our stay. We were there in July and first week of august, it was a great value for money also. Pico Bello was a good as it looked in the pictures on Booking.com! Greetings and thanks to Manolis and Kingsley!